Make plans now to join us at SpaceCom 2018, where NASA, aerospace, and industry come together. The expanded exhibit hall now has exciting new pavilions and programs showcasing cutting-edge technology for both the aerospace and commercial industry sectors. Suppliers—read about the benefits of exhibiting in our exhibitor section. Attendees—below are highlights that you’ll experience on the show floor. View the floor plan and make your time more valuable onsite by searching for exhibitors and setting appointments before the event. You will be able to check out the latest technologies and ask questions directly to the product innovators about how space applications can fuel business innovation for your organization and your industry. NASA Center Theater: All NASA Centers are invited to spotlight their market-ready technology to attendees and share best practices. Read more. ISS Anniversary of Construction Celebration: Join us on the show floor Tuesday, Nov. 27 at 12 p.m. as we celebrate the 20th anniversary of the construction of the International Space Station. Sponsored by Engility. The SpaceCom Opening Reception: Join us on the show floor Tuesday, Nov. 27 at 5 p.m. for networking, heavy hor d’oeuvres, and beverages to kick off SpaceCom 2018! 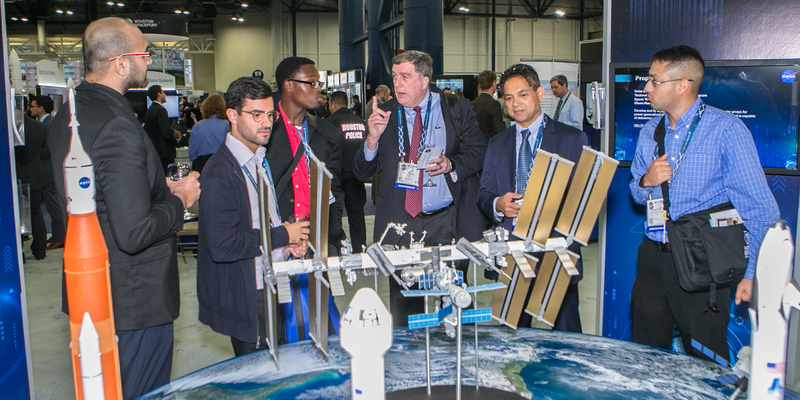 See product demonstrations, hear the latest from NASA, and make connections with fellow attendees. SpaceCom Entrepreneur Summit and Pavilion: Along with a two-part workshop and a pitch competition, you can visit with innovative startup companies in the pavilion on the show floor to see the latest technology hitting the markets. Read more to participate or show up for the competition and vote on your favorite. Networking, Demonstrations, and More: There is always something exciting going on at the SpaceCom exposition, whether it’s astronaut meet and greets, a sample of moon rock, or robots, to name a few. Come be part of the forward thinking innovators who are changing the way we conduct business, travel, and communicate.